On 29 September 2009 I reported the sale of the 37.8m motor yacht Wheels and now Chany Sabates at International Yacht Collection sends in a note to say she's back on the market, sporting a brand new interior. Built in 2002 to ABS class by Trinity Yachts, this all-aluminium superyacht has an excellent charter history, sleeping 10 guests in five cabins, and she cruises at 15 knots. 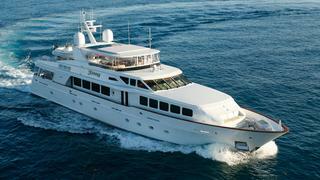 Lying in Fort Lauderdale, Wheels is asking $7,775,000.